Technical Car Experts Answers everything you need: After replacing throttle body the Check engine light starts blinking? Its quite possible that throttle body is not replace properly. But as you said check engine light is blinking,this indicates,there is error code stored in cars computer. In this case this problem is noticed on 1996 Toyota Tacoma. Do you have a code reader to find out what the code numbers are that may be set in the engine control computer? This error code will help,for further troubleshooting. We need to start by getting the malfunction code number from the computer. This is done with a generic code reader that can be purchase for less than $50 these days. If you can get to a nearby auto-parts store they do free code reads for example O'Reillys or AutoZone. You need to confirm that the throttle cable is adjusted correctly and that the throttle opener, the little diaphragm on the front side is not stuck on and has vacuum going to it. The throttle position sensor on this vehicle is adjustable. You may want to remove the negative battery cable to try and clear the memory. The other possibility is that the idle speed control motor is stuck or frozen. This is bolted to the bottom of the throttle body. Did you remove it and clean the carbon from it before you installed on your engine? If not please do it and see if that helps. The throttle opener is highlighted. The throttle opener should be functioning correctly if the vacuum is applied and released. The idle air control motor that I'm referring to that gets carbon buildup is on the bottom with the small gasket not highlighted. Throttle position sensor needs to be adjusted correctly. The bottom two pins need to be checked with an ohmmeter and should make and break contact or have continuity and break continuity right when the throttle is cracked open. Make sure the throttle opener is not holding the base of the throttle idle up. 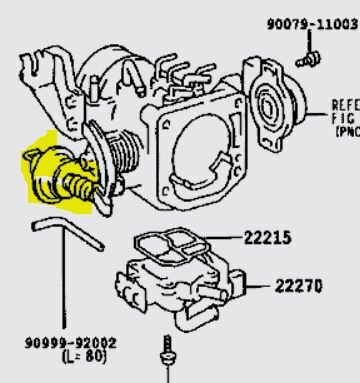 The idle air control motor on the bottom of the throttle body as seen in the picture is the part number 22270. This is what needs to be cleaned. The throttle position sensor is what needs to be checked with an ohmmeter. Your checking the continuity with the connector disconnected the bottom two pins are the IDL points in the sensor. With the throttle completely closed they should be open and have no continuity just as you crack the throttle open you should get continuity. If you don't have continuity then either the sensor needs adjustment or the sensor is faulty. It means that the sensor needs to be adjusted. If you cannot get continuity to make and break just as you crack the throttle the sensor is not adjusted correctly. There is an actual specific measurement that you have to set these two but typically if you just crack the throttle open you should have continuity between these two pins. What other car mechanics normally do is watch the ohmmeter and hold the throttle plate completely closed then rotate the throttle position sensor until you have continuity then slightly bring it back until it opens then tighten the screws. Then recheck it by simply opening the throttle and watching the ohmmeter open and close continuity. How to Remove Throttle Body on Acura Car Models? Saab 9-5 Aero Throttle body problem? Engine won’t rev up past half throttle?